Looking for something interesting to serve at your next beer event? How about a unique candy that offers both sweetness and a connection to the beverage we love? Gummibierchen are just what you need. Gummibierchen or Gummy Beer, are jelly candies from a nation famous for both their beer and their gummy candy. They take two of Germany’s best known products and put them together. It’s a bit like a shandy, though not as sweet as other jelly candies. Fruity with a small hint of beer. Bit lemonade with a beer-note in the aftertaste. A satisfying chewiness to be enjoyed. While they don’t contain alcohol (a great snack for the designated driver too), they’re a tasty snack for beer tastings or any time. An addition to a cheese or charcuterie plate, they can be used to add something sweet to the mix. Or try pairing these slightly sweet gummies with something savory. Plenty of pairing options, or you can just eat them as a stand-alone snack. 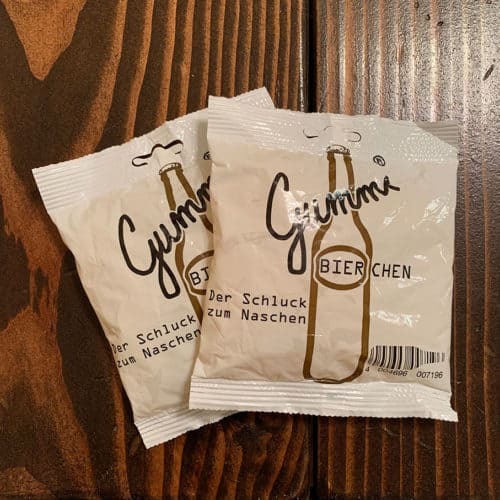 For those searching for a sweet and satisfying treat, Gummibierchen are the perfect option to comfort their craving for sweet, with a bit of the flavor of beer they love. Chewy, lemony, beery, they’ve got a bit of everything for the candy (and beer) lover. Grab a bag of Gummibierchen beer gummies from their website or find Gummibierchen on Amazon now. They’d make a great addition to your next beer event. Just try not to eat them all before the guests arrive.